Tired but happy, the six of us wrapped up our last day of holiday fun in New York City with a little shopping and museum browsing. A good time was had by all! On the last day of our whirlwind trip to Manhattan, we repeated our breakfast routine while making plans for the day. With only so many hours left, we decided to split up so that we could all spend the remaining time doing the things we really wanted to do. Tilara and Mary headed up to the north side for some shopping while the rest of us went to the Museum of Modern Art, better known as the MoMA. Interestingly, the taxi driver misunderstood us and thought we wanted to go to the Metropolitan Museum. Thus, we kept going farther and farther north, and about the time I was really relishing the sights of Central Park, I realized we had overshot our location. When we mentioned it to the driver, he apologized and said he thought we’d said the Met and not the MoMA. Here’s the neat thing. Although we got in some extra sightseeing, he took it off the meter and didn’t charge us. That’s a little thing, and yet it’s a big thing too. I LOVE that museum, and that day it was especially awesome. Cloudy, overcast, and cold on the outside, it was toasty and warm on the inside. From the huge windows, I enjoyed the outside views while savoring the wood floors, the hushed sounds, and of course the magnificent exhibits and paintings. Everything took on a different (special) aura that day, perhaps because I was sharing the experience with good friends. Too, I think the holiday spirit was abundant, thus further buoying my mood. From the moment we walked in and saw the display of words, I knew it was going to be a great morning. 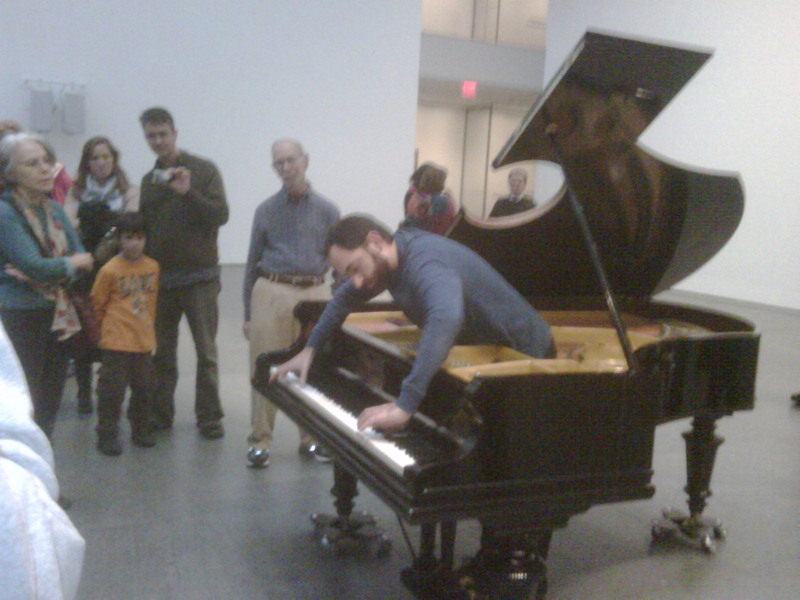 Jeanita and I heard piano playing, and when we saw the cluster of people gathering around it, we moved closer and saw a man standing INSIDE of the piano playing backwards. I loved seeing the work of Andy Warhol, Van Gogh, Klimt (especially the painting of the pregnant woman), and Wyeth. One of the things I learned that day was that the young woman in Wyeth’s painting Christina’s World had polio. I had always assumed she was just lying in the grass looking at a farmhouse and was stunned when I realized that she was actually inching her way towards it, a sight that Wyeth saw from a window. I also learned the term”magic realism,” something I experience quite often. We couldn’t leave the museum without a visit to the gift shop for a few goodies. 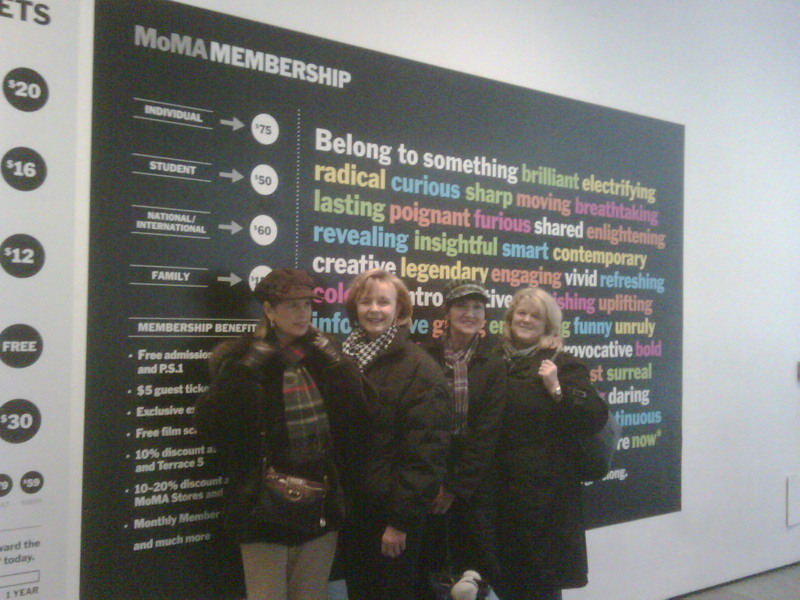 My personal favorite is a black t-shirt with the letters MoMA across the front. When we walked outside, I saw something else delightful, something I’d never see in Camden if I lived to be 100, a skilled dancer across the street who was performing for passers-by. Boom box blaring, she was energetically dancing with skill and talent. Where is the crew from Dancing with the Stars when you need them??? Fortunately, we were able to snag a taxi right away and headed back to the Staybridge where a car was picking us up to take us to the airport. 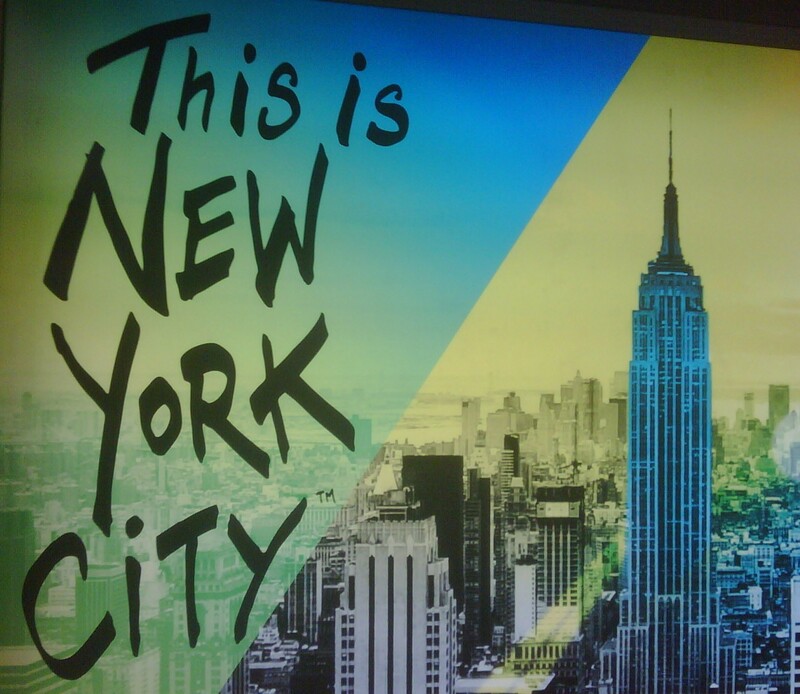 We’re such a positive bunch that we even enjoyed our ride to LaGuardia, especially the Queens scenes. I felt like I was on the set of the old Archie Bunker sitcom of the 70’s. Upon arrival at La Guardia, we went straight to our gate after passing through security (not bad) and sat and waited for a couple of hours. While none of us really enjoyed waiting so long, we figured it was better than taking a chance on missing our flight. Plus, there were many interesting sights to see, and the snacks were yummy. Love those Dunkin’ Donuts flatbread sandwiches! The flight back to Myrtle Beach was smooth, fast, and uneventful. 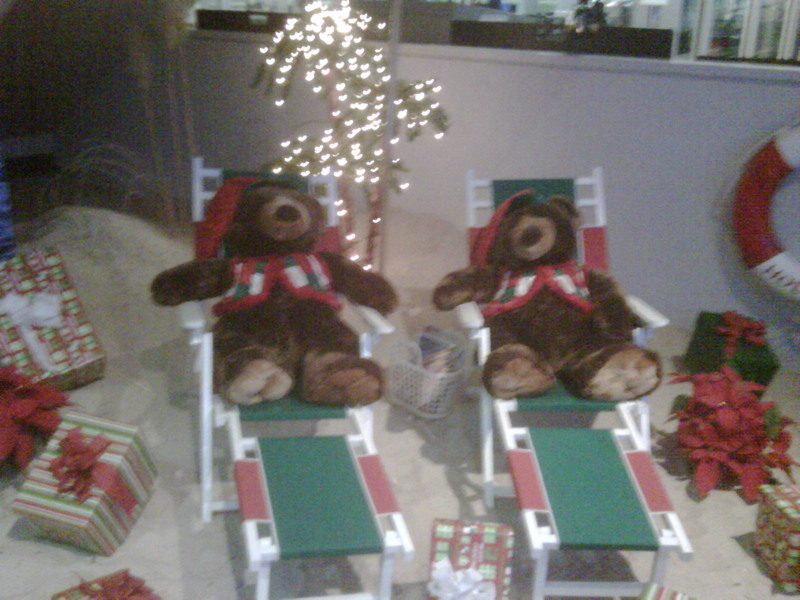 Seeing the stuffed bears reclining in beach chairs in the airport all lit up for Christmas was the icing on the cake. Tired but happy, we stopped at the Piggly Wiggly at Market Commons for some pizza and then went to the condo to eat and share memories. Truly, a good time was had by all.